Keep your tabletops tidy with this brown rectangular sugar caddy! This sugar caddy is a classic sugar caddy with a traditional rectangular shape and rich brown color. Side cutouts make it easy for customers to pull out the desired sugar or sweetener packet, while smooth, rounded edges give it an inviting appearance. These rounded corners also promote safety, minimizing sharp edges, and they ensure easy cleaning without harsh 90 degree corners. At the same time, a sturdy plastic construction makes it very resistant to damage while promoting cleanability. With this sugar caddy, you'll be able to store up to 20 yellow, blue, pink, and white sugar packets with ease! This Brown Plastic Sugar Caddy is perfect for sugar,salt packets, we are happy with our perchance and expect it will stand up to the daily use and drops. This is perfect for holding sugar. Well, I guess if it was perfect it would be exactly the size of a sugar packet. I'm not really sure why they make them to be weirdly a little bit bigger than a sugar packet. We purchased these sugar caddy’s to place on the table for customers. They are a very strong plastic and hold up well if dropped, washed in the dish washer, or kids banging them. Holds sugar great and looks nice. Love saving money with the price. These little ones are very handy to have, economical, attractive and easy to clean. We're very happy we tried this and would not hesitate to but them again in the future. this is a nice sturdy sugar caddy for the price. made of thick brown plastic, this handy little box holds sugar and creamer packets at your restaurant. This nice brown caddy retains its shine because of the plastic surface. It measures about 3x2.25 inches. Organizing packets is what this caddy does best! 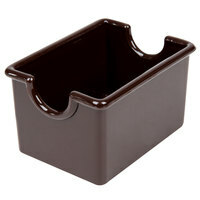 This brown plastic sugar caddy is great for any restaurant or café. Holds coffee creamer and sugar packets nicely and keeps them organized for your customers. This brown sugar caddy is a great value. Made of sturdy plastic, these are easy to clean and look great for years. These fit nicely on any table and hold sugar and creamer packets. This brown sugar caddy is very inexpensive and will hold 20 sugar packets. The brown color is not our favorite but it would work nicely in a diner for casual café. The Caddy is made of plastic and can be cleaned easily. This sugar caddy is a nice deep chocolate brown color. They hold plenty of sugar packets in a very organized way. The plastic is high quality and durable. This is a great sugar caddy. They are easy to clean out when sugar spills inside. The plastic has nice smooth edges and it holds approximately 25 sugar packets. These sugar caddies are so affordable it's hard to believe. They come in handy for not only sugar packets but tea bags as well. Love them. This is a great sugar caddy. Perfect for any diner to store their sugar or stevia. They are very light weight but the plastic is thick. Not only can this nifty sugar caddy be used for sugar, you can use it for office supplies. The quality met my expectations and it is a great value. I like lighter colors than black, more noticeable and doesn't blend in as much, great for condiments, sugars, artificial sweeteners it's great for all you need! The Brown Plastic Sugar Caddy works great for sugar or tea packets. The quality is very good as well as the price. I would definitely purchase again if needed. This brown plastic caddy is perfect for that tavern or rustic kitchen look. Solid construct fits roughly 20 packets of sugar so no need to keep refilling. This caddy holds about 20 sugar packets. Made in China. Plastic feels a tad on the cheap side, but it's exactly what I expected for the price. Perfect size for sugar packets. Seems to be made well. They're easy to clean and hold just the right amount of packets. Worth having around. At our restaurant, brown sugar caddies are used for sugar in the raw. Using color codes insures that employees all know where to put each product. Good price and product. Items were exactly as described. The product is very handy and liked that they came in the color brown. Great price for them as well. What a great solution!. We have 4 different kind of sugar. but now ice and neat on tables. Easy to clean it up. and Great price! If I were to purchase a similar one through my food service provider it would have set me back by a lot more for two of these and I got them for cheap on this website. You cannot beat most of their prices and dealing with their customer service department is always a pleasure. Wow...great price for such an essential to many food service establishments. While not really anything special in terms of design or color, these get the job done. This sugar caddy is perfect for frequent use. The brown color is attractive but helps hide minor stains from daily use. Light weight but very sturdy!